Sterling dropped to a nine-month low against the euro after the downward revision to the growth forecasts. The pound fell about 0.76% to 1.1063 euros. The bank voted 6-2 to keep interest rates on hold at 0.25%. They have been at that level since August last year. Mr Carney said that business investment was slower than it would have been expected to be because of Brexit. "It's evident in our discussions across the country with businesses," he said, "that uncertainties about the eventual relationship are weighing on the decisions of some businesses." He said that investment had been weaker than otherwise would have been expected "in a very strong world" and the consequences of that was starting to build: "The speed limit of the economy, if you will, has slowed." 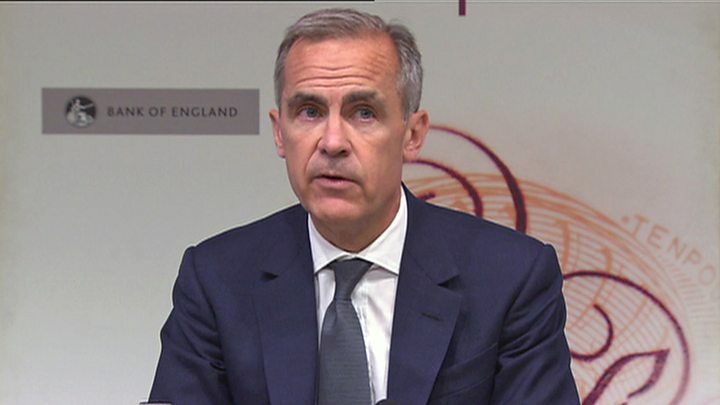 Mr Carney said the Bank expected business investment to pick up from its current "very subdued" levels, but that it was still below historic rates. He added that Brexit uncertainty was also hitting pay negotiations. "There is an element of Brexit uncertainty which is affecting the wage bargaining. Some firms, potentially a material number of firms, are less willing to give bigger pay rises given that it is not as clear what their market access is going to be over the course of the next few years," he said. Former British Chambers of Commerce director general and co-chairman of pro-Brexit lobby group Leave Means Leave, John Longworth, said he agreed that business confidence is "lower than it ought to be". Mr Longworth added that Bank of England was "notoriously bad at forecasting", so "we should always take it with a pinch of salt". The big squeeze on incomes will get tighter from here and will last longer than previously thought. At the moment, prices are rising 2.6% while wages are rising just 2%. That gap is expected to widen later this year. Inflation is expected to peak at about 3% in October, as the surge in import prices caused by the post-Brexit-referendum drop in the pound continues to feed through to shop prices. When prices rise faster than wages, we get poorer on average every day. This explains why the Bank cut its forecast for economic growth for this year and next. It is also the main reason why the Bank of England has decided - for the 120th month in a row - not to raise interest rates. The Bank is also now gloomier on prospects for wage growth and thinks wages will grow by 3% in 2018, down from the 3.5% estimate it made in May. Weak wage growth, combined with rising inflation, has been weighing on the spending power of households. There has not been an interest rate rise since July 2007. Many economists think the UK could see a move this year and recent speeches by Bank officials have raised that expectation. Monetary Policy Committee (MPC) member Andrew Haldane recently said an increase might be "prudent" in the second half of this year. The bank highlighted that the 18% fall in the pound since November 2015 has been raising the price of imports for the UK, which in turn has been making life more expensive for consumers. Shoppers may have noticed significant increases in the prices of items such as butter, meat and computer software. The bank also said there had been evidence that spending on cars, home wares and electrical goods had been falling. It also noted weakness in the housing market and a fall in consumer confidence, which it thinks could indicate that households will curb their spending in the months to come. The bank expects wage growth of just 2% this year, which is well below price inflation, currently running at 2.6%. To help bridge the gap between weak wage growth and inflation, consumers have been borrowing more, aided by low rates. In its report, the Bank said that interest rates on a £10,000 personal loan were close to record lows. Bank officials have been expressing concern about household debt. Last week, Alex Brazier, the financial stability director, warned that High Street banks risked entering a "spiral of complacency" over mounting consumer debt. Members of the MPC also voted in favour of extending a credit facility to British banks from £100bn to £115bn. The so-called Term Funding Scheme (TFS) runs until February 2018 and has already lent £78bn to banks at close to the bank's base rate of 0.25%. The TFS is backed by the Treasury.